Drug policy, whether or not you use drugs, is important to you. It’s important because the UK spends £13 billion of taxpayers’ money annually on trying to win the drug war. It’s important to you because there are numerous countries around the world that are being deliberately destabilised by drug dealers in order to make it easier to produce and smuggle drugs, such as Afghanistan and Mexico, and neither we nor anyone else can negotiate or protect our national interests in countries where the government has no control. 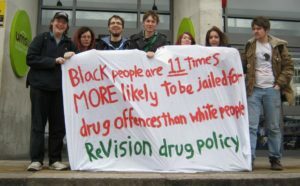 It’s important because in the UK, a black person is twelve times more likely to go to prison than a white person for the same non-violent drug offence. Cannabis can treat pain, nausea, and reduce the effects of various conditions such as Crohn’s disease and multiple sclerosis. …but we cannot explore or develop these uses because the government wants to stop people “getting high”. Drug policy is about human rights, and if you believe that racism, murder and gang violence are unacceptable, then you should support drug law reform. 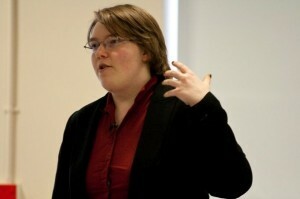 Addressing SSDP UK National Conference in 2009. Students for Sensible Drug Policy UK: A national chapter of the American organisation, founded in 2008. I served as External Relations Officer and built the largest university society at the University of Manchester (I think we topped out at about 600 members), but ended my involvement over an internal matter in 2010. SSDP UK continues to operate. to run a national charity with limited experience while finishing our degrees caused us to burn out. We’ve tried to place it in the hands of other volunteers but none have worked out so far. Six years on, there is still no mass movement in the UK dedicated to drug law reform, and I still have control of all of our internal documents and materials, domain name and website. I will happily hand over and provide advice, support and contacts to anyone with the qualifications and experience to take Re:Vision on, so if you are that person, please contact me. 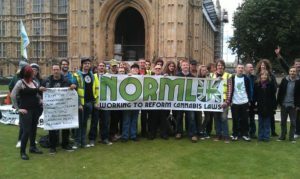 NORML UK: The British chapter of the National Organisation for the Reform of Marijuana Laws in the United States. I fell into the cannabis community after I blogged about the appalling racist, homophobic blogposts written by Peter Reynolds, the leader of CLEAR – Cannabis Law Reform, a cannabis political party. Peter Reynolds responded by making increasingly intense personal and public attacks on me and reporting medical cannabis patients who had also criticised him to the police. The Executive Committee of CLEAR, unable to control him or the scandal, resigned en masse and founded NORML UK in March 2012, and invited me to sit on the board. Bedrocan protest on College Green outside Parliament in 2014. I served as Press Officer, Secretary, and then as my interests in other areas began to increase, stepped down and became an Adviser. Unfortunately the cannabis community has very few systems of accountability and there were successive scandals of unvetted board members acting unprofessionally and falling out with other activists and groups. Eventually a group split off to form the NORML UK Women’s Alliance, which I also advised. I finally called it a day on drug law reform when NORML WA changed their name to The Lady Gardeners, which I thought was a very silly name that I didn’t want to be associated with. NORML UK continues to exist but acts mainly to distribute funds to other active groups. An important side-note: Peter Reynolds, leader of a substantially reduced and disgraced CLEAR, continued to attack both myself and NORML, which ultimately culminated in his issuing libel lawsuits in the High Court against myself and three other activists in February 2013. Being as everything I had said was true, I chose to defend myself as a litigant-in-person, and what ensued was a 18 month legal battle that Peter Reynolds chose to settle just before a date was set for trial. As I have several hundred pages of documentation and screenshots of evidence, I do intend to eventually write a book about my experiences. Provisionally entitled Cannabis and Conmen, I’ve written 20,000 words to date but I’m waiting for technology to catch up with Facebook so I can access the remaining evidence I need to finish the story. In the meantime, I have written an overview and collated all of my writing on Peter Reynolds and CLEAR. Below is everything that I wrote for all three organisations on the topic of drugs, drug policy, and drug law reform. You can also read several items about drug policy in my media section.